Read the new Second State of the Carbon Cycle Report (SOCCR2). The U.S. 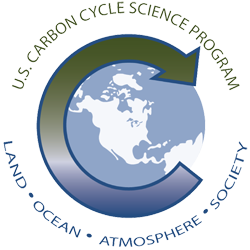 Carbon Cycle Science Program, in consultation with the Carbon Cycle Interagency Working Group CCIWG), coordinates and facilitates activities relevant to carbon cycle science, climate and global change issues under the auspices of the U.S. Global Change Research Program (USGCRP) Interagency Committee or USGCRP Principals. The CCIWG supports the peer-reviewed research of carbon cycle science across the federal government and is responsible for defining program goals, setting research priorities, and reviewing the progress of the research programs that contribute to carbon cycle science. See more info on the 4th order draft of the 2nd State of the Carbon Cycle Report (SOCCR-2) here. Twelve federal agencies and departments coordinate and support our program activities. The Program Office is led by its Director, Gyami Shrestha Ph.D. Logistical support for the Program Office and the activities it leads is remotely provided by the UCAR/CPAESS in Boulder, Colorado.